Signature intrecciato woven napa leather. Alexander McQueen crocodile-embossed leather clutch bag with golden hardware. Hinged clasp with signature skull and embellished four-ring knuckle duster. Interior, two zip pockets. Slim, pouch style. Approx. 2"H x 11.8"W x 2"D. Made in Italy. 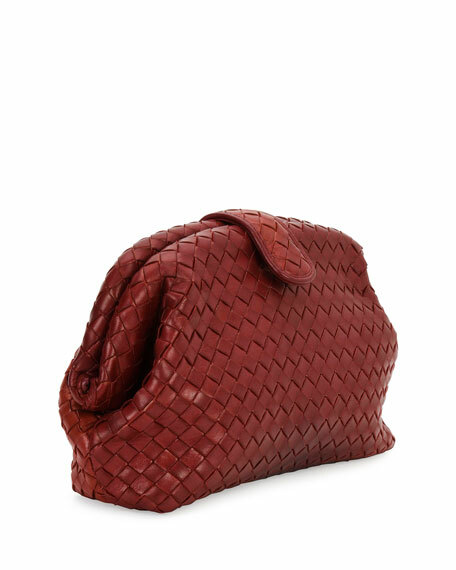 EXCLUSIVELY AT NEIMAN MARCUS (Medium Beige only) Bottega Veneta woven satin clutch. 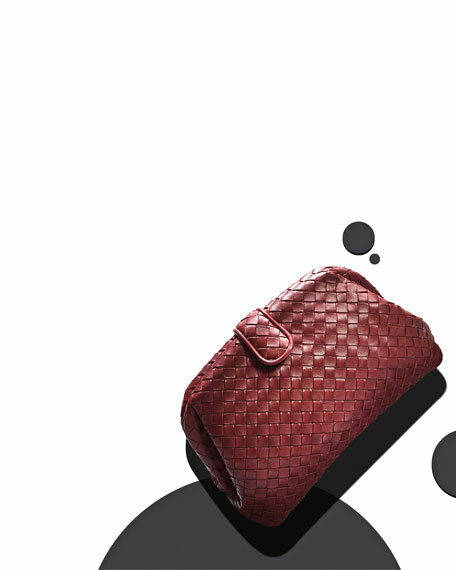 Shiny tonal snake trims hard-shell body with rounded corners. Burnished gunmetal push-lock clasp with knotted, woven design. Satin lining. 4 1/2"H x 10"W x 1 1/2"D. Made in Italy. Christian Louboutin holographic, crackled calf leather card case. Top slip pocket; card slots at front and back. Logo lettering at center front. Signature red sole stud at back. 3.1"H x 3.9"W x 0.2"D. Made in Italy.